In this, the fourth installment in our series on the four leadership intelligences—Awareness, Trust/Integrity, Authenticity, and Commitment—I conclude our inquiry into supporting the development of the being of being a leader. The last three blogs explored Awareness, Trust/Integrity, and Authenticity. Commitment calls us to stand for something bigger than ourselves. 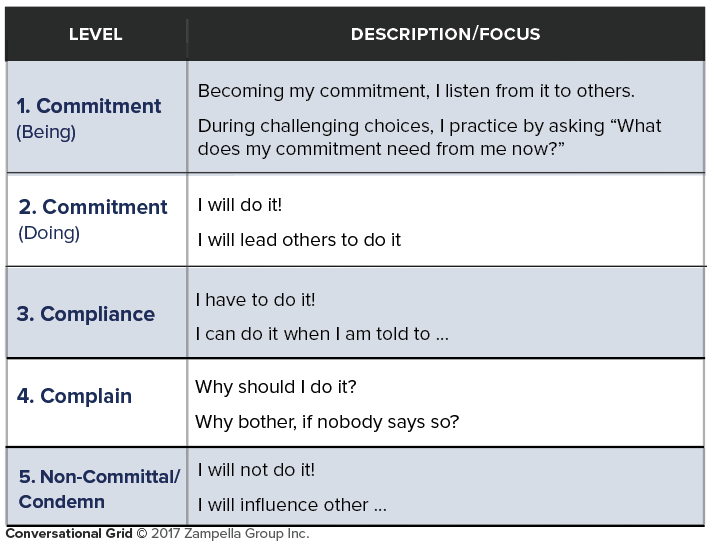 To discuss commitment requires a shift in perception from a third-person phenomenon that I accomplish commitments, to a first-person phenomenon that I generate commitment. As a leader, I am responsible for generating both my own commitment and, eventually, a shared commitment that frames situations, relationships, and work. Without any organizing commitment or North Star, each event will occur as a series of random tasks or unconnected choices without any compass guiding us. In an ordinary context, commitment often implies an obligation to someone or something outside us. Buddhists, by contrast, view commitment as a vow to embrace a way of life: who we are, how we live, the way we show up. This Buddhist approach to commitment comes not from obligation to another but from a vow to oneself. Commitment to something larger than ourselves, rather than satisfying personal desires, provides us with a sense of purpose that can be very consoling and calming. We often conflate and confuse commitment with instrumental ideas, such as compliance, attachment, obsession, passion, obligation, sacrifice, goal, motivation, or inspiration. In contrast, the Buddhist perspective views commitment is a vow to embrace, as a way of life, who we are, how we live, how we show up. Commitment empowers us to act in the face of our fears and justifications to face whatever we are experiencing, now, in the moment as more fundamental and all-encompassing to give greater meaning to life. In this context, commitment generates rather than defines action and direction. It can ground us and provide a sense of purpose. It can provide direction in life. It can give us something to serve. It can help us evolve emotionally and in wisdom. It can provide a context for making decisions. It can prevent us from acting on unhealthy impulses. It can unify the mind. Moving beyond our fears to fully engage in something—whether it’s teaching, a career, fitness, relationships, or learning—requires first evaluating what is worthy of our whole being. Is it worthy of our time or what matters most: for the sake of what am I now engaged? Commitment requires that we stand for something bigger than ourselves. We can be more than our individual desires or narrow concerns about survival. We can stand for a compelling future that finds us in action, we can stand for changes that we know make a difference with the resolve to constitute our whole being. For instance, a commitment to learning finds us becoming a learner, open and available to discovery in any situation. We are also then ready to generate a shared commitment to learning with others. As a commitment is given by something bigger than ourselves, we choose to stand for a future beyond our trivial concerns that can include and transcend our sensations, thoughts, emotions, and circumstances. Once embodied, commitment animates and transforms our being. THE SHIFT: Over the last 15 years we have evolved from the previous command and control model of leadership, which demands compliance. Today, our pace of change demands that leaders encourage a great deal of agency and purpose that cultivates commitment beyond oneself. OUR PRACTICE: Using generative language, we cultivate our commitment and generate a shared commitment. Through reframing tasks and events, we (re)discover and generate our commitment in surprising ways. Even a setback can remind us why we are involved in any project or situation. With mindfulness, we can pause and either recommit or opt out and fortify our direction. YOUR FUTURE: Our commitment from a compelling future, cutting through the noise that is human life today, is key to sustaining a culture of leadership and learning. The three hardest words for leaders to utter are “I don’t know.” Yet, until we can become comfortable with not knowing, we cannot fully discover, inquire into, or embrace the uncertainty that marks this time in our organizational lives. This is where cultivating commitment is a fundamental first step to establish a context bigger than our personality, or identity. Commitment grounds the journey of becoming a leader and learner. It supports leadership to 1) generate a shared commitment within the organization and 2) to tap the individual commitment of all participants. We invite you to use your entire life as a vessel to cultivate and generate commitment. Use these questions to guide you in creating your own commitment statements. Then inquire into that statement to inquire further such as a stand I take or contribution I stand for. What is something I am willing to stand for? What moves me to create change? From these questions above, complete a personal statement that identifies who you are as a commitment (what you are committed to). This need not be more than a sentence. Once you create that commitment statement, allow yourself to live in it as an inquiry as such. For the sake of what am embracing this commitment? What is the difference it will make? What is the possibility it will make available? This last set of questions brings your commitment statement from an abstract intellectual idea to a meaningful “why” or core purpose in your life. Keep engaging in inquiry until you are moved by something bigger than yourself. Engaging an inquiry for insight is different than investigating a question for answers. A humble inquiry begins with “I don’t know”, and can be both insightful and challenging. Take the time either in one sitting or in multiple settings, and notice what emerges. Stay with the questions, as you walk, respond to email, water plants, or play with kids. Be surprised when ideas or thoughts come your way. Finally, live with your commitment – at work, in public settings, and in life – and see how it moves you into action, to learn, grow and to make changes. It is also important to note that the singular most important predictor—present in all four intelligences for leadership development—is listening. With regard to commitment, we can listen for commitment in ourselves and others, as well as, listen with commitment, and listen to commitment. This singular predictor both cultivates all four intelligences and supports the evolution of leadership mindsets. Listening deserves much more attention, some of which we have explored in this four-part blog series. At its core, an inquiry into listening is an inquiry into the nature and function of being as detailed in each of these four intelligences. Part 1 in this four-part series explores Awareness, leadership intelligence #1. Part 2 in this four-part series explores Trust/Integrity, leadership intelligence #2. Part 3 in this four-part series explores Authenticity, leadership intelligence #3.